Oh man. This is really tempting. 67F is a new record for these parts, but it’s a great temperature for getting out on the road. A few more miles and it will be a new December record for me as well. Still fine tuning the X bike, but its turning out to be a fun ride, as always. Last year at this time there was snow on the ground. This year there are people mowing their grass. 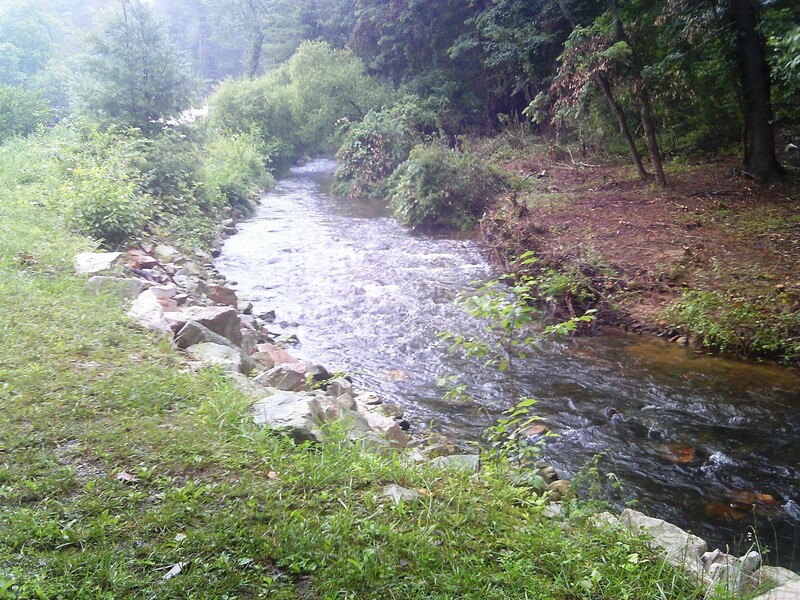 Riding along the Yellow Breeches, I spotted a guy in deep with his waders on, casting a fly rod. Down a bit further, two kayakers. We all waved and smiled. Some yards have Christmas lights, other have stage coaches. Off to the right is a Pennsy caboose. So I’ve managed to ride more since Thanksgiving than I have in the four months previous. Mainly I had to get into wood scrounging mode, along with some house/yard projects, along with life and job in general. Almost all of the riding has been at night, thus no pictures. and it’s been chilly…no…downright cold at times. Still, I find myself overdressing, usually the result of wearing a thin wool layer covered by my down sweater. Until it gets below freezing, or I get covered in sweat, the down is just too warm. I have to rethink my clothing/temperature chart once it gets below 40F. The tinkering has not stopped. On the Trucker I got the Crazy Bars dialed in nicely with a taller stem, and the shifting got much better after I took apart the pods and sprayed some Teflon in the works. The bike is my steady traveler. As for the X bike, which has been logging most of the miles recently, it has once again undergone a transformation. Its back to the Albatross bars, but with a longer and slightly higher stem that used to be on the Trucker. That seems to have made the difference, because the cockpit is much more comfortable. 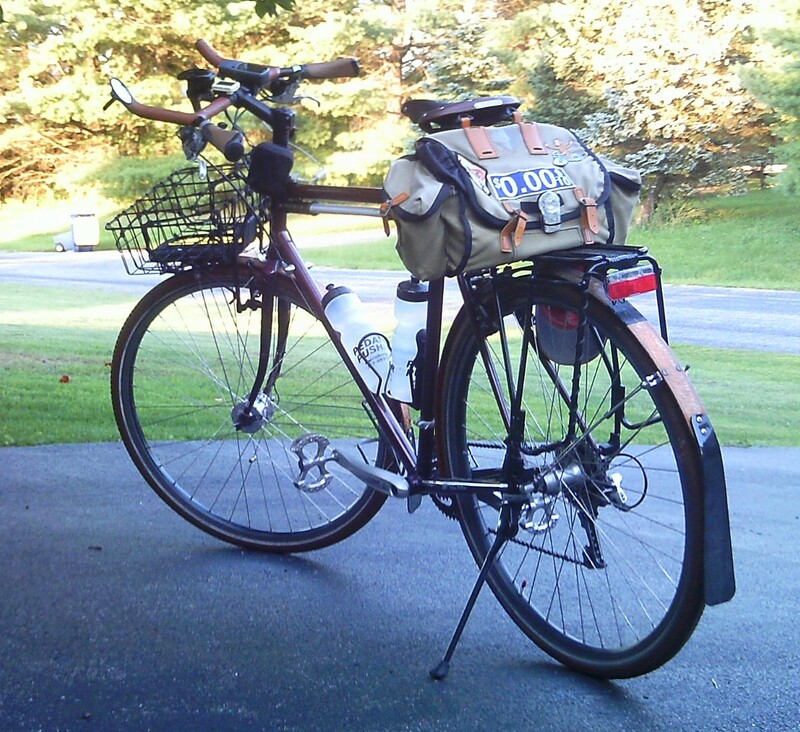 I’m fiddling with saddles, Brooks v. Selle; and the headlamp has been upgraded to a B&M Cyo Premium. The light will most likely be the subject of its own post, but I’ll just tease with saying that the beam is wider, smoother, and brighter (80 lux v. 60). Its actually a better beam than the Luxos on the Trucker. I managed to pick it up for an incredible price on-line, and then got a good price on the Cyo Plus that it replaced. So as time permits I’ll try to get a few more posts and some pics up. The weather, while nippy, has been dry and the backroads lead for some beautiful night rides. What About Them Crazy Bars? 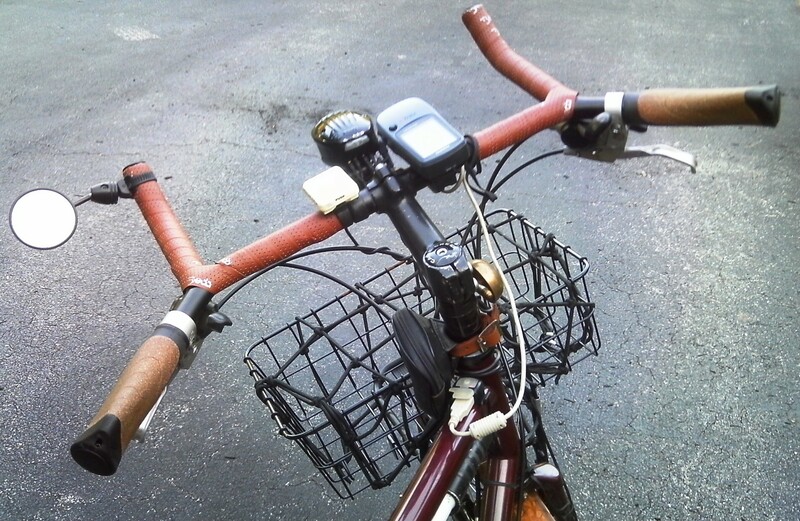 It’s been a month now since I installed the Velo Orange Casey’s Crazy Bars on the Trucker. Other than the S24O shakedown ride, I’ve only taken a few shorter rides on this bike since then. Still, at this point, I can say that I have a pretty favorable opinion of them. I’ll start with the downside right up front: They just don’t have the classic styling that the Albatross bars brought to the bike. The MTBish look is better suited to a…MTB. Still, touring is about comfort, and as much as I enjoy both the look and feel of the “collegiate” style, these bars are better. FWIW; I am thinking about putting together another frame around a lightweight Oxford roadster setup. So about these bars… Firstly, I prefer the less severe angle at the grip position. If I’m riding and just let my hands lay on top of the bars, this is the angle that they assume. Having bars with the grips at this angle suits me better. To complement that, the bars have a pair of fancy ergonomic cork grips. Note how they are tilted up in order to keep the wrists straight – it really does work. Next are the additional hand positions. I find myself gripping the “corners” where the “horns” are welded in, the straight flats on either side of the stem, and periodically leaning in and stretching out over the frame by gripping the ends of the horns. That’s four distinct positions compared to the Albas, which had two at best. If I could improve them…I might make them a little narrower. I realize that goes against the current trend with Jones and Surly to have wide bars for leverage, but I just don’t see it for touring. I’m used to 46cm drop bars and a similar width on the Albas – these are way wider. Other than that, its still taking some time to get used to shifter pods. I have to admit that there is an aspect about them that I like, but I’ve been using barcons for so long that I miss them on this bike. I’m thinking a better made pair of shifting pods might help since these can be finicky at times. I’m hoping to get in some longer rides towards the end of the month with these, so I’ll report back. To our bike camping contingent around these parts, if I mention “The Meadow”, they pretty much know where I’m headed. It does have an official name, and its actually considered a parking area, but the parking takes place for the most part in an adjacent lot. So this gets called the Meadow. In typical S24O fashion, this came about at the last minute. 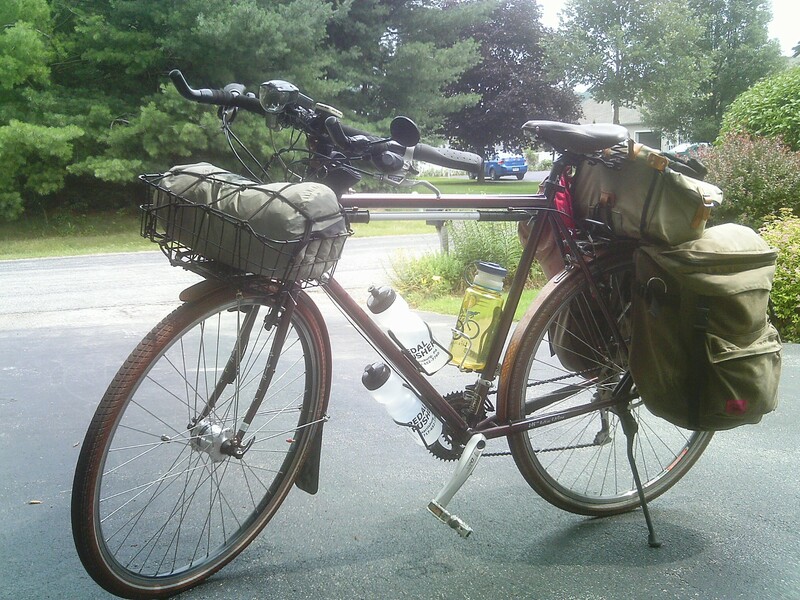 Earlier in the week my schedule opened up, the forecast looked promising, and I started some bike modifications that I had been thinking about. By Friday morning the forecast had turned, with a 60% chance of rain starting that night. I thought about it for a bit, and decided I would take my chances with the 40% chance of it not raining; plus all the fancy gear I carry is made for dealing with rain. I said goodbye to Red as I was walking out the door, much to her surprise. Pretty much the standard kit, although I realized this would be the first time using the new titanium cookset. I packed some extra food for a nice breakfast, but also packed a minimal breakfast (oatmeal), if things got really ugly. These are Velo Orange Casey’s Crazy Bars. The setup is not final as I’ve already changed the stem and have plans for the cockpit, but my initial impressions are very favorable. The main position is just at the correct angle, and the additional positions make for a comfortable ride. The Luxos U is also back on the Trucker. I avoid riding on Fridays, but the traffic was unusually light because of the holiday and probably the forecast. At 20 miles I stopped to stretch a bit. I was also getting used to the shifting pods now on the bike and the whole world of indexed shifting. The park store had the usual band of Appalachian Trail hikers congregated around a table. They seem like a nice lot, but they always appear a little standoffish. 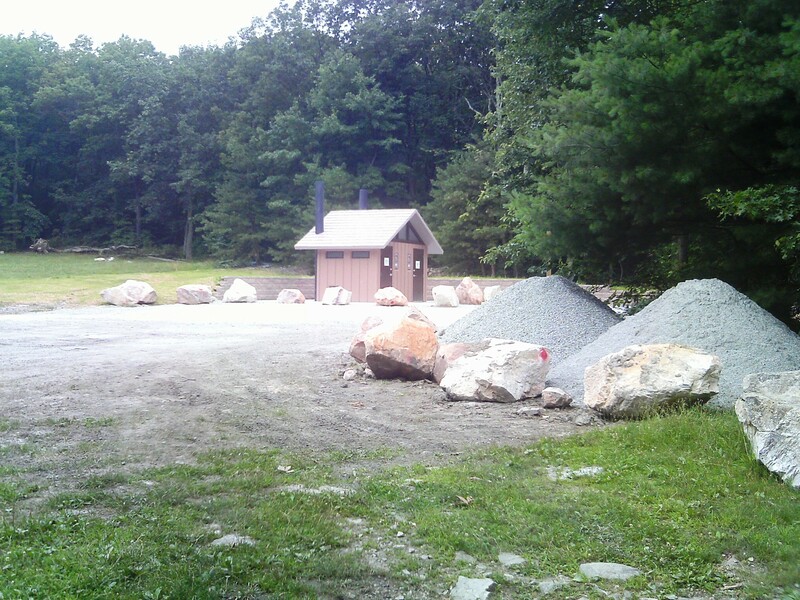 I enjoyed an ice cream, filled up my water bottles, and started up the mountain. 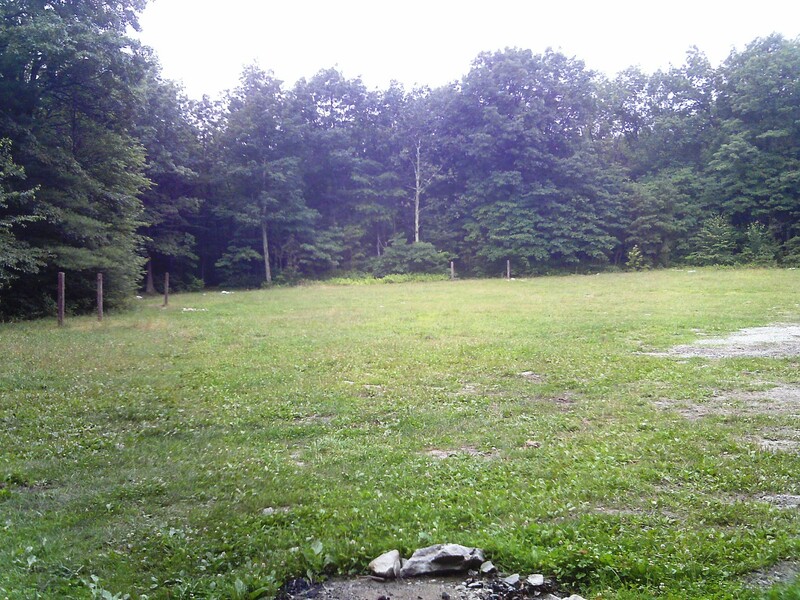 There were a few four wheelers running the trails and parked in the lot, but the meadow was completely empty. I picked a spot under some trees and camp went up quickly. Some new bio-toilets. Next we’ll have running water and hot showers. Dinner consisted of heating up some leftovers from the fridge and then reading “Treasure Island” by the fire. A decent breeze kept the bugs to a minimum. Things were quiet until around midnight when a pack of very loud four wheelers came into the entrance to the meadow and were taking a break. One of them was upset over something – I was more concerned over their rowdyness and being outnumbered – I was probably a little paranoid. 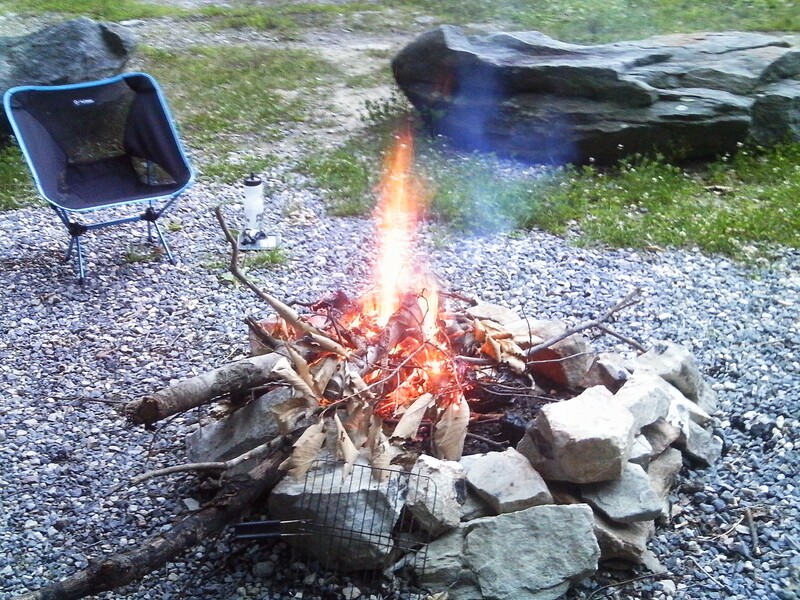 I actually was out of the tent and behind a bush when they spotted my campsite (probably the reflective tent cords). Since there were no cars in the lot, and my bike was hidden from view, they pretty much freaked and took off like they had discovered an axe murderer’s hideout. Admittedly, I was a little skittish, but I think they took the worst of it, and I can laugh about it now. The clouds opened up around 1:00am and didn’t let up all night. 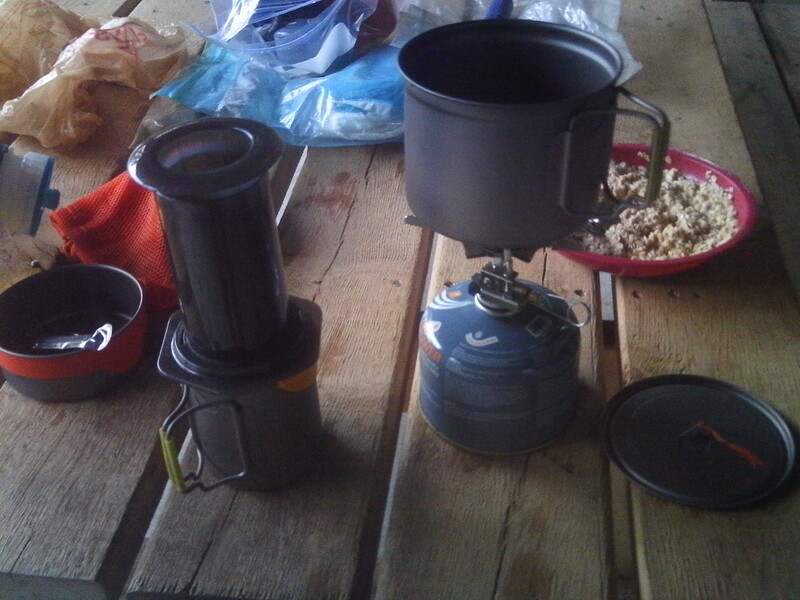 Around 7:30 there was a break, so I was able to make coffee and oatmeal in a nearby pavillion and break camp. The rain got heavy again, but the temps were in the mid-60’s, and I had a cheap plastic poncho that worked out fine. Coming down the mountain, water was everywhere. Twenty miles from home and back where there is cell service I get a text from Red that she wants to leave for the in-laws, so my leisurely pace and plans for second breakfast are out the window. I pulled in well below the 24 hour mark, but my legs are toast and I’m soaked to the bone. Still, I’m smiling. I figured that I could have cancelled and been a bit frustrated, or I could take a chance and at the very least, have a challenging adventure. The rain proved a challenge, but not overwhelming. Life needs some adventure. Sucky weather all weekend meant no real riding to speak of, but drinking coffee, doing some cleaning, and laying about watching movies. 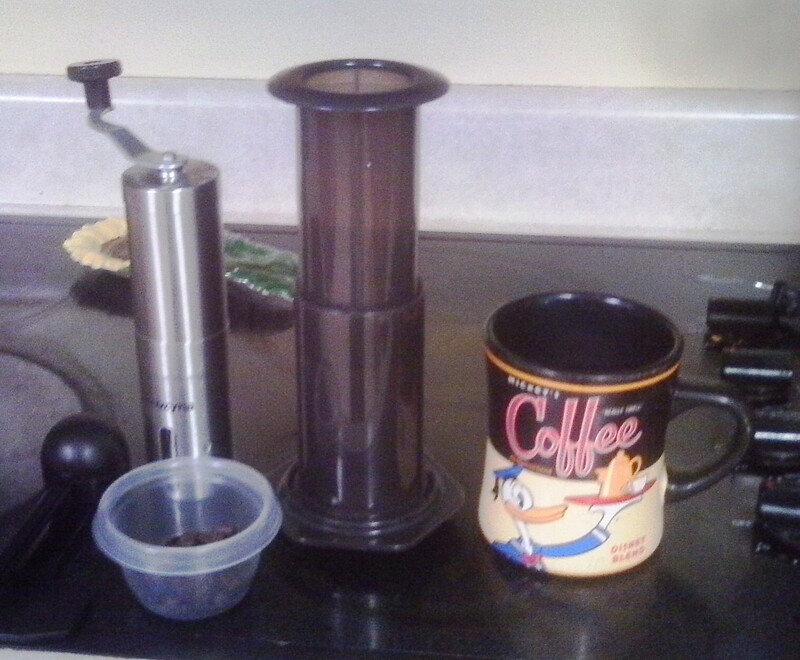 We got some dark roast beans and I put the grinder to work. I now know what all of the excitement is about. Clearly the best cuppa joe I’ve ever had. The house smelled so good even Red came out to the kitchen and took a sip, and she’s a tea drinker. It must be good, because both days I skipped my afternoon power naps. 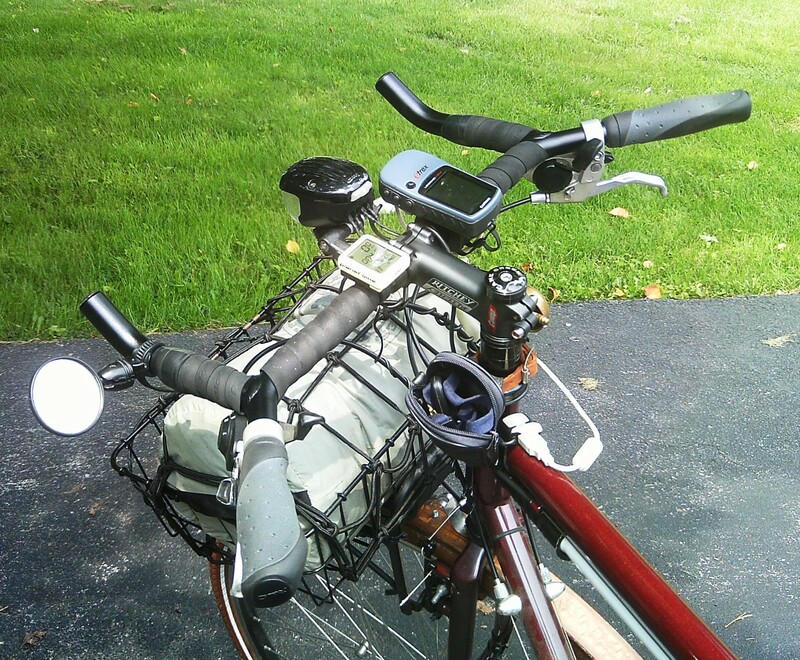 After last Saturday’s ride and the shoulder/neck pain that I suffered after 50 miles, I decided that it would be good to switch to the Trucker for a few rides with an upright position. The Trucker has seen very little miles thus far this season. Wow. I did tweak the saddle a little, but the difference in overall comfort is incredible. I suddenly remembered why I love this bike so much, and now I’m wrestling with whether to continue with the X bike, or the Trucker, on my quest for a century. The Trucker is heavy and I can easily feel the weight difference, but it also demands a different riding style, ie: less agressive, lower gears. Another big difference is the tires and how they eat up the bumps. The X bike is fitted with 32c Vittorias while the Trucker has the 40c Little Big Bens. The difference is so evident that it has to have an effect on comfort over the long haul. Very soon I plan to switch wheelsets and see how it changes the X bike’s ride. Finally is the Highway One drops v. the Albatross. If I can strengthen my core and neck muscles to tolerate the “tuck” better over distance, then I’ll be OK. Otherwise, the Trucker wins for comfort hands down. And….would having smoother tires relieve some of that pressure once they were switched to the X bike? I intend to play around with different setups because that’s what I like to do, but it will be interesting trying to find the right combination of parts and measurements to get the perfect distance machine. It will be ironic if it ends up being the trusted ol’ Trucker.